Favorite Charlie Chaplin, Buster Keaton, or "Fatty" Arbuckle Film! I've been watching a lot of silent comedies recently, and I've got a few new favorites. I think my new favorite Charlie Chaplin movie is The Rink (1916). I think the scene where he mixes the drinks is even better than his "roll dance" from Goldrush (1925). TCM showed several silent comedies recently, which was your favorite? I enjoyed seeing Mabel's Willful Way (1915). So, what are your favorite Charlie Chaplin, Buster Keaton, or Roscoe Arbuckle films? In general, I'm not a big Chaplin fan, as his films are often a bit too sentimental for my liking. However, I love The Kid (1921), because I adore young Jackie Coogan. He was such a beautiful child and a natural talent. He brought out the best qualities in Chaplin. Also, The Circus (1928) pleasantly surprised me. I liked A Woman of Paris (1923) which Chaplin directed but didn't star in. Chaplin intended it to be a showcase for Edna Purviance, but even though she's great, the story was a bit on the soapy side. I like the Arbuckle shorts with Keaton, especially Coney Island (1917) and Good Night, Nurse (1918). Guess I just can't resist Roscoe in drag. His dog, Luke, is pretty great, too. Buster Keaton, to me, is the greatest of the silent comics. I'll mention Sherlock, Jr. (1924) because it was the first of his silents I saw (and that was thanks to a promo at TCM where Woody Allen cited it as an inspiration). Besides the two features TB mentioned, I'd highly recommend The Navigator (1924) and Steamboat Bill, Jr. (1928), but as always, beware of inferior scores. One Week (1920) is probably my favorite short. I watched The General last night and loved it. It really made me like Buster Keaton a lot more, I think I'll finally watch a few of his films I'd recorded a while back but never watched. I think The General showcased some of his skills I had not noticed before. Yes, it's his incredible stunt work (anything for a laugh) that impresses me most about Buster Keaton. I love the moment when he is trying to jump over the fire on the tracks and falls through the hole on the other side! I didn't even notice there was a hole on the bridge where the boards had fallen out until he fell through it; it was so sudden, I loved it. What do you think of Harold Lloyd? I know i didn't put him in the thread title, but I was watching one of his movies the other day and realized I never payed attention to how funny he is! I think my favorite harold Lloyd film is Number, Please? (1920). I saw it again when they played it on TCM recently, and remembered how much I enjoyed it. So do you like Harold Lloyd, dislike Harold Lloyd, or have you seen his films before? He seems to be a little less known. Count me in as a Harold Lloyd fan. He's my favorite comedian from the Silent Era. I find him charming, good-natured and, of course, very funny. 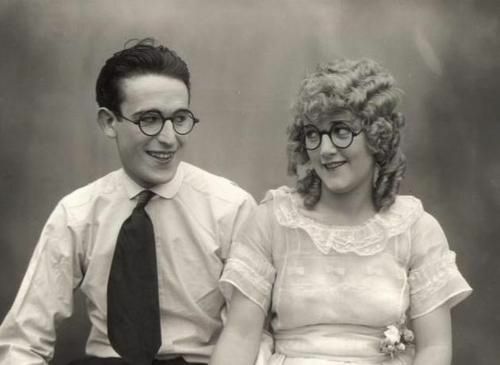 What do you think of Harold Lloyd? 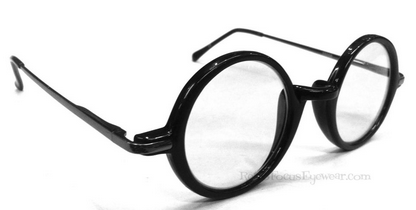 Sometimes I'm not sure if I'm more a fan of Harold Lloyd or his eye wear. That's really cute. What a photo! I love his movies with Mildred Davis. Safety Last (1923) is so funny, I love when he pretends Mildred has "fainted" so his boss isn't mad that he's in his office! And, of course, the scene where he climbs the building is both funny and very tense; I was holding my breath every time he stumbled near the edge! ...the scene where he climbs the building is both funny and very tense; I was holding my breath every time he stumbled near the edge! Yes such athleticism, and true suspense. These are films one can enjoy watching over and over. It seems no matter how many times I watch it, it never gets old. I saw a post once that asked if you were on a desert island and could only bring 5 movies with you and that would be all you had for entertainment, which 5 would you bring? I definitely think Safety Last (1923) would be one of mine. I am particularly fond of Fatty Arbuckle's "Coney Island" , which also includes Buster Keaton. I'm from that area and loved seeing the old amusement parks, i.e., Luna Park, Steeplechase, etc. I have the movie on DVD and watch it over-and-over.